Rolling a joint like a pro is all well and good but think about how fat and juicy a turkey leg is! This joint will not only impress your friends but all show how thankful you are for the plant we so fondly refer to as Mary Jane. No matter how well versed you are in the art of joint rolling, it’s always fun to test your knowledge and try something new and inventive. Now that you’re on board, it’s time to gather a few things you will need to roll a turkey joint. Don’t worry, you won’t need anything out of the ordinary which makes the turkey joint that much easier to make! First, roll a filter out of your filter paper and set it aside as you roll a short but thick and fat joint. 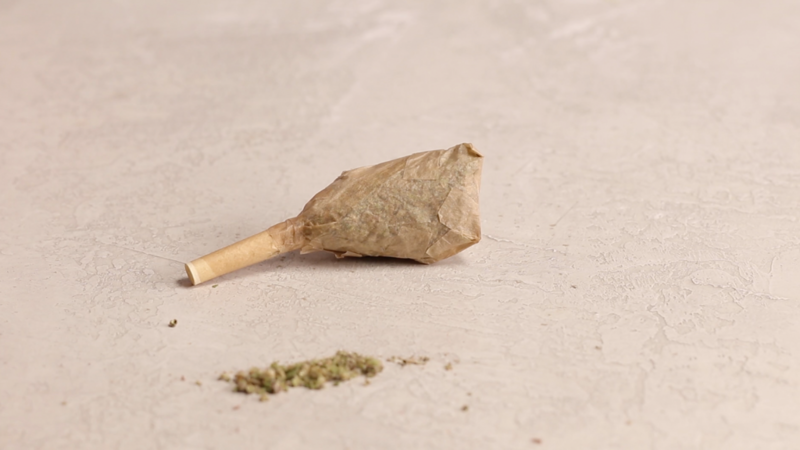 Insert your filter paper as you are rolling, and make sure to roll your joint into a slight cone shape. Once it’s rolled, fill it with ground cannabis and make sure to pack the marijuana down to get a tight pack. Twist the excess paper after packing, cut off the tip, and set it aside. Now it’s time for the big boy. Using two more rolling papers, connect them side by side by attaching the edge of one paper to the glue strip on the other to make a larger, almost-square sheet. Folding from the bottom right or left corner up, fold diagonally into a cone. Using another paper, cut off and use the glue strip to flatten the tip. You should now have a large pouch that is sealed with the glue paper. Cut off the excess paper, so your cone is even, and fill it up with more of your ground cannabis. This is going to take a bit of bud, so be ready with a grinder on standby! Once you’ve filled the cone a little above half-way, insert your joint into the center of the cone. Using yet another glue strip, wrap the top open end of the cone around the joint to seal the base. Once you’ve fully sealed the base, you’re done! You should now have a super fat turkey leg-shaped joint that is packed full of quality cannabis that can help with turkey tummy, holiday stress, or getting the Thanksgiving party started! If You Could Smoke Weed With Anyone, Who Would It Be? What Are Cannabis Mother Plants? Why You Should Clone Your Cannabis Plants?